Second Reflection Forum took place in Trieste, Italy between 26th and 27th of June and convened a wide range of different experts working in national and European administrations and institutions, as well as researchers affiliated with European think-tanks and Universities in the EU and Western Balkans. Event was organized under the patronage of Italian MFA as a process leading to the next intergovernmental conference on the Western Balkans hosted by Italy in July, 2017. Second reflection forum was dedicated to regional cooperation, where three areas of reflection have been identified: the resurgence of bilateral and regional tensions, the gap between regional cooperation in repressive and enabling security matters and the pitfalls of gendered models of economic development. Speakers were not delivering their presentations ex-cathedra, but used a participatory and interactive approach, where debates were moderated by experienced experts. Platform was provided for interesting debates touching upon issues like what comes after the Berlin process, where ideas spurred around building on achievements so far, but also finding a more participatory, innovative and regional approach, since actions so far have not yet provided viable results. It was also stressed that following years are crucial for deciding what do we actually want from EU and who do we want to see in it, since influence of non-EU countries in the WB is increasing. 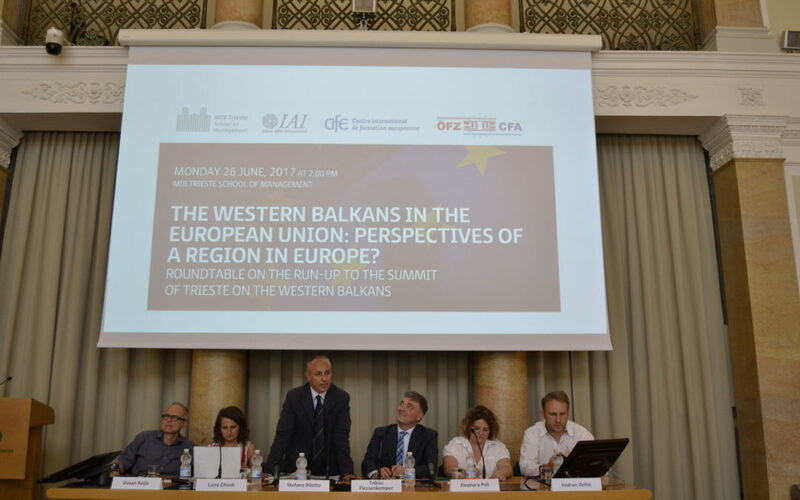 Further on debate revolved around contribution of the WB to the EU, and discussing what the region could actually bring to the Europe. On the other side, participants from the WB remained less optimistic and argued there is no such thing as enlargement, which is according to them not happening, and new, innovative solutions will have to be implemented; while questions arose on what has actually gone wrong, since even years of democratization and EU integration have not brought the region onto the right path. Importance of investing into infrastructure and knowledge was stressed as a prerequisite for any further development of WB. At the end of two-days event, CEP has together with the Slovenian Ministry of Foreign Affairs organized a closing dinner in Portorož, Slovenia. Diner was opened by Mr Peter Grk, National Coordinator for Western Balkans at the Slovenian MFA, who stressed the importance of such events, where opinion can be exchanged and common solutions provided. He also stressed the importance of stability in the Western Balkans for stability of all Europe, and shortly presented what Slovenia does in the field. Organised by Istituto Affari Internazionali (IAI), Rome; Centre international de formation européenne (CIFE), Nice/Berlin/Istanbul; Austro-French Centre for Rapprochement in Europe (CFA), Vienna. In cooperation with French Institute for International Relations (Ifri), Paris; Stiftung Wissenschaft und Politik (SWP), Berlin; Austrian Institute for International Politics (Oiip), Vienna; European Union Institute for Security Studies (EUISS), Paris; Centre for European Perspective (CEP), Ljubljana; Balkans in Europe Policy Advisory (BiEPAG), Graz; Osservatorio Balcani e Caucaso (OBC), Rovereto. With the support of Central European Initiative (CEI); Regione Autonoma Friuli Venezia Giulia, Ministry of Foreign Affairs of Italy, Ministry of Foreign Affairs of France; Federal Ministry for European, Integration and Foreign Affairs of Austria; Federal Ministry of Foreign Affairs of Germany; Friedrich-Ebert Foundation (FES), Berlin/Sarajevo.